Hello everyone, I’m so sorry this week’s scribble is a bit late but we’ve had snuffley humans all over the place. First of all Delia went down with a cold and then my mum caught it down the phone so we’ve had to fend for ourselves at our house and I’ve been a bit busy washing and cleaning to sit down and write. We’ve got some very good news this week - Oscar, the bunny who was abandoned on Bobtails’ doorstep last week, is to be rehomed with Annabelle and Jonathan. He’s just waiting to find a girlfriend and then he’ll be off. I’m so pleased because he really deserved a chance to be happy - as all our bunnies do. And now for some bad news. Every year as soon as the clocks go back we get loads of calls from people wanting rid of their buns. Sure enough, on Tuesday Delia put 22 unwanted buns on the waiting list. It’s all because children are coming home when it’s a bit darker and colder and don’t want to be out in the garden with their rabbits. Of the 22, 18 were born in January or February and bought at Easter time from pet shops or garden centres. I think it’s disgusting and these people don’t deserve any of the love us bunnies have to give. I hope you all coped well with the fireworks. My wife Floss was very nervous, running about the house like a headless chicken. I just snuggled down in my bed and was grateful to be indoors with a nice roaring fire, feeling very very safe. The lads in the top shed told me they suffered the usual torture from Delia, who, bless her heart, sings at the top of her voice to try to mask the bangs. They were so glad when the bangs finally stopped because it meant Delia also stopped. I heard Delia saying to my mum on the phone that the rescue is full to bursting, so if you do fancy a new boyfriend or girlfriend, do pop in and have a look - there are some beauties and cuties looking for love. Last week Delia insisted double trouble Florence and Dougal were very well behaved and not at all naughty, but this week when I asked her about them the first word she used was ‘naughty’. I was going to ask them to write something this week, because they are supposed to be trained up to take charge of Scruff’s Scribbles soon, but they’ve been told no more internet use until they buck their ideas up. Despite all the chairs being pushed under the dining room table, somehow the monsters have managed to get on the table and eat the pot pourri. Delia thinks it’s been a team effort, with one of them perhaps rocking the chairs out away from the table edge, and the whole thing has definitely been masterminded by Florence as she is far more intelligent. Dougal’s as a daft as a brush. They are little monkeys. I can’t wait until they’re let loose on Scruff’s Scribbles. 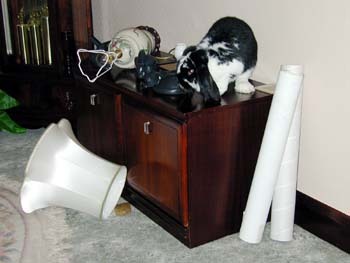 Anyway, I’ll end with a warning involving bunnies and toilets. Auntie Pat told all the bunnies at the rescue last week that her Jack had a very lucky escape when he jumped into the toilet. Luckily Pat’s husband Roy was on hand to save him from going round the u-bend, but it could have been very nasty. My mum always puts the loo seat down, and is always on at dad to do the same. She told me that people need to watch their baths too. Us bunnies are a silly breed sometimes. Anyway, I’ll be off for now. Nudgey cuddles until next week.